A permanent solution to the problem must stop all six ways water can enter your basement or crawl space and it must do it forever. Nothing can get in the way, restrict, or clog the water. If it cannot stop all five ways, then it does not make sense to spend your hard-earned money on that method. The most effective, efficient, and affordable waterproofing solution available is the French drain. In other parts of the nation, the French drain is often referred to as a drain tile but in the northeast, the term French drain is prevalent. The French drain was named after American innovator Henry French who popularized the idea in the late 1800s as a means of providing farmlands with proper drainage. In those days, drain tiles were little more than a ditch filled with gravel and pitched from a high area to a lower one. They were also generally used outside the home. While much has changed in the last 120 years, the simple and elegant design of French’s drain tile has remained the most efficient and reliable means of keeping water out of a basement. The invention of plastics and the advent of flexible piping and affordable pumps have significantly improved the French drain design. While such a system can still be installed on the outside of the home, an external French drain can be prone to clogging. 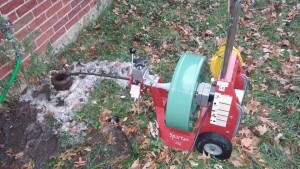 Because of this, most waterproofers today prefer to install drain tiles around the interior perimeter of a basement, leading to the terms “perimeter drain” or “basement drain tile.” Today, modern methods and technologies, combined with a century of research, have led to the most effective and affordable wet basement solution available. Why should you choose Sewer Specialist Cleveland for your Basement Waterproofing?